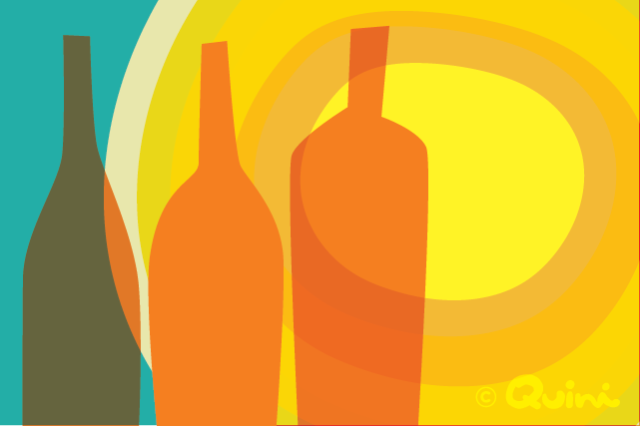 In the final installment of our summer wine series, Alana Musselman gives you permission – and great ideas on how – to trade in your tired Pinot Grigio for the new wines of summer. It’s summer for a few more weeks, so why not give them a try? It’s a known phenomenon amongst sommeliers here in Las Vegas that as the temperatures begin to rise, so, drastically, does the consumption of Pinot Grigio. There’s nothing wrong with drinking that old summertime standby, but the truth is… we’re dying to serve you something – anything! – different. You can find some great Pinot Grigio recommendations on your Quini wine tasting app, but if you’re ready to step out of your crisp, easily quaffable comfort zone, these four wines are a great place to start. In the northwest corner of Spain, in a region called Galicia, there is a lush wonderland called Rίas Baixas, and this vineyard-striped wonderland is where Albariño is born. I’ve heard it described as quirky, and it’s true, if you’re just learning how to taste wine this varietal can be a tough one to pinpoint. The flavor profile can vary widely, but the bottles I love the most tend to have bright citrus, honeysuckle, crisp green apple, and an undercurrent of minerality that gives the wine an intriguing edge. Enjoy a glass with grilled fish tacos or paired with an endive, manchego, and slivered almond salad with a sherry vinaigrette. I love Santorini. Mind you, I’ve never been there, but I see pictures of white and blue buildings dotting the coastal cliffs and my heart just goes pitter patter, and the only wine that can properly pair with that pulse-racing oceanfront beauty is Assyrtiko – luckily, it’s indigenous. Even if the closest you’re getting to Greece this summer is enjoying a child-free hour in the hammock, this varietal’s signature swirl of lemon pith, kaffir lime, dried apricot, ruby red grapefruit, slate-driven minerality (courtesy of the volcanic soil the grapes grow in), and bone-dry mouthfeel is practically transportive. The beautiful French region of Alsace is home to one of my earliest varietal crushes, the highly aromatic wine called Gewurtztraminer. Easy to drink and infinitely approachable, it’s hard not to love the fragrant aroma of grapefruit, lychee, pineapple, rose, honey, and spices like cinnamon and ginger. The level of residual sugar can vary from dry to sweet, and it’s typically full bodied with fairly low acidity, making it my go-to tipple when I’m eating a light mid-summer supper of smoked salmon and goat cheese scrambled eggs on a little pumpernickel toast. Most new wine lovers just delving into wine tasting basics will hear Argentina and automatically think of Malbec, but when the hot summer heat threatens my sanity, I hit up another Argentinian favorite – Torrontés. Just like the English translation of its name would suggest, this wine is a veritable torrent of alluring aromas, with peach, grape, orange, lime, honeydew, lychee, apricot, white pepper, jasmine, lavender, and some added depth from the stony soil it grows in. Torrontés can handle a bit of spice and smoke, so I say fire up the grill and fear not – this is going to be one delicious summer. Tell us – do you have a go-to summertime wine, or is your cellar all about variety? Alana Musselman has heard that man cannot live on wine alone, but she’s more than willing to give it a try. When she’s not eagerly learning anything and everything about food and booze, she spends her time freelance writing and slinging wine on the glittering Las Vegas strip.